In stock -This product will ship today if ordered within the next 10 hours and 40 minutes. Bio Health Extra Magnesium is an essential component of bones and teeth. Not all diets obtain an optimum level of magnesium. 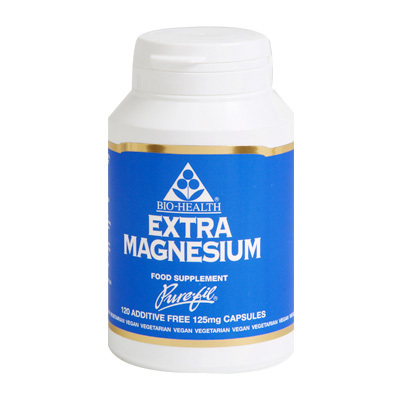 In such cases, the Extra Magnesium may help you to make up this shortfall. Magnesium is involved with some of the B vitamins acting as a co-factor in hormonal and enzymatic activity. It is also closely involved in the body’s use of calcium and helps deposit calcium in bones, and is without a doubt an important mineral for muscular and nerve functions. Bio-Health’s unique blend of magnesium sources includes magnesium gluconate (for added bio-availability) and provides 125mg of pure elemental magnesium. Three capsules daily equals 100% of the European Union’s daily recommended allowance and is recommended if the diet is poor or lacking in foods containing magnesium. Relaxation is the key to well-being, and magnesium helps maintain muscle function and winding down at night. Magnesium Gluconate, Magnesium Oxide, Magnesium Carbonate, Vegetable hydroxypropyl methylcellulose (HPMC). 3 capsules daily swallowed with water. Below are reviews of Extra Magnesium - 120 Capsules by bodykind customers. If you have tried this product we'd love to hear what you think so please leave a review. Good easy to swallow capsules with no fillers or binders.